A CB is a very important tool to have when out on the trail. I have always settled for walkie talkies just to get me by, but I decided to get a CB radio in order to have a solid form of communication when out on the trails. 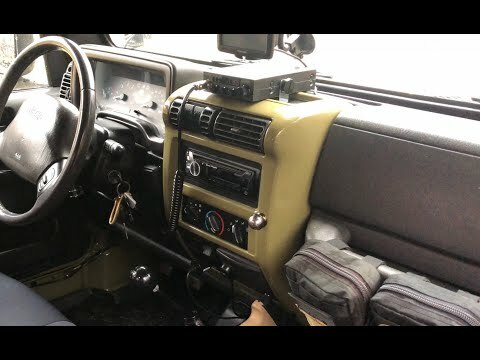 In this video, I install my Uniden 520LX radio with a 3′ Firestik. I also made my own tail light antenna mount out of some scrap metal. I hope you enjoy the video and it helps you get some ideas for your own CB setup! The total job cost me about $70. IF you're still having grounding issues on your antenna bracket, the easiest way to make sure it's on there right is to find someone with electronics experience, like an electronics technician. Have them help you get it installed properly, it's easy enough that most techs should be willing to help. May have to bribe someone with beer and pizza, or something else. Basically the plastic washer is there to isolate the (hot) upper part of the stud. The upper part has the RF power flowing through it to the antenna. The lower part of the stud is isolated from the top, by the plastic washer, and grounded via the bracket. Only the lower part of the antenna mounting stud should be contacting the grounded bracket. The internal center conductor of the antenna stud, where the coax cable's center connector pin is inserted into the antenna stud, is where the RF power flows and should not be contacting ground. By the way, I have the exact same radio and antenna on my TJ, and it works really good once set up properly. Does the fire stick whip around and hit the jeep with the spring? I was also having grounding issues. Make sure your stub that connects to the antenna is not touching your mount. Just make that hole bigger and tighten it down so it doesn’t shift. Also look up bonding. I own a JK and bonded it for my Ham radio. Tailgate to frame, frame to engine, body to frame, exhaust to frame, battery to frame, radio to frame, etc. My SWR dropped a lot. with a 20 meter ham stick, from St. Louis have reached South Island New Zealand (8300 miles), Most of Europe, and South America. CB (11 meter band) won't travel that far, but the concept is the same. What kind of fuel door is that?